Guns In Churches? Where is God? 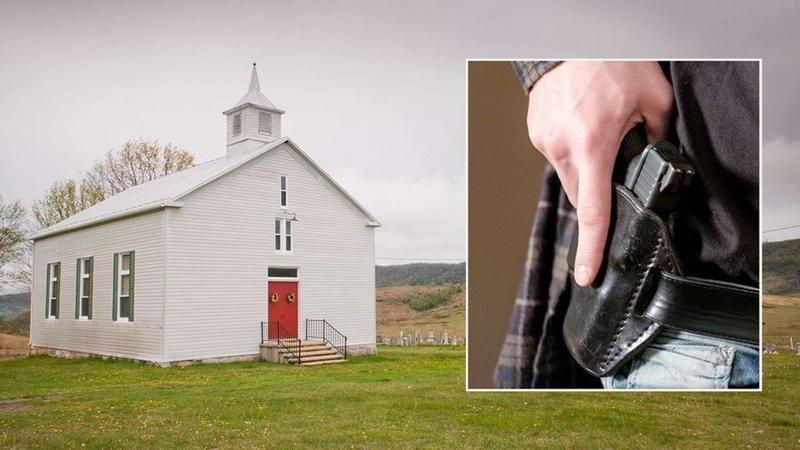 Churchgoers in Virginia could soon legally bring their guns alongside their Bible after a bill cleared the state Senate last week and sparked a heated debate about whether packing heat could help save lives -- or is a slap in the face of God. The bill passed on strictly partisan lines -- 21 Republicans supported it and 19 Democrats opposed it. But the debate was turned heated. The bill would repeal a law that reportedly dates back to colonial times, which makes it a misdemeanor to carry "a gun, pistol, bowie knife, dagger, or other dangerous weapon, without good and sufficient reason, to a place of worship while a meeting for religious purposes is being held at such place", in the state of Va.
Why are we making the place of worship and "Houses of God" War Zones? God is not enough? Guns Were Made To Kill. Who doesn't know that? CHURCHES BE "GUN-FREE ZONES". It appears Republicans everywhere, don't know what to do with power, shows signs of ungodliness. "More guns, in more places, in more hands", leads to more carnage, deaths, the massacre of the innocent, seniors, and children. Who is behind this foolishness of weaponizing churches and the arming of pastors? With some research, it may prove that the NRA is behind it and the encouragement of gun sales. After all, handguns are more popular than before. At the same time, more children and family members are killed. Today's Christians seem to be spiritual stooges for extreme right-wing politicians. See my past threads and posts on guns. God has not called Christians out of darkness to be promoters and executioners of societal wrongs. Funny, in SC there is a law still on the books that require men over 16 to carry a rifle to Sunday service to ward off Indian attacks. Regardless of time or place, Guns were made to kill. The outcome is the same. The SC Law of "a rifle" was due to the then "Churchgoers" for their Trump-like behavior toward the Native American Indians: Stolen lands, broken treaties, mistreatment of Indian women, and the killing of their men. And how about the fact that the law you said is being replaced COULDN'T HAVE gone back to colonial times? No its not. It is about telling the truth. Telling the truth about when laws came about. Telling the truth about what it means to have guns in churches and schools. Self-defense is not murder. Believe it or not, there are appropriate times to take the life of a human being in a manner that is in accord with Scripture. Telling the truth about when laws came about. Telling the truth about what it means to have guns in churches and schools. This I have done and you know it. Guns kill! The Native Americans were mistreated by Anglo-immigrants (invaders). Your putting on a show for the public is misleading. History is on my side. Look it up. @reformed said: "...Believe it or not, there are appropriate times to take the life of a human being in a manner that is in accord with Scripture". Yes I wholeheartedly endorse the biblical practice of Capital Punishment. I endorse wholeheartedly self-defense (also biblical). I am disgusted that you are charging me with endorsing abortion which I most definitely do not. I'm not ashamed of my positions. I fully embrace biblical teaching. Don't you think America has experienced enough deaths: Wars, accidents, crimes, and hate groups many using guns? Thanks for pointing out that abortion is not killing. A person must exist in order to be killed or died. Oops! Thanks for the correction. Yes, but guns do not cause those things. That is not what I said AT ALL. Abortion IS KILLING. It is MURDER. No, my position cannot be used to justify lynchings and the like. Stop the propaganda. OT Laws-- what is relevant today? The worth or the value of human life vs an item in the home? Abortion -- Killing the non-existence, how is that possible? The Moral laws. We no longer follow the purification/ritual laws. Did I say human life vs an item in your home? No. You aren't killing non-existence. You are killing a human being. If you ask the question here I am going to answer it here. If you want a new thread you feel free to start one.